It’s no secret that I love pumpkin soup. I’ve got a weight watching version, a spicy version and even a pumpkin and sweet potato combo right here on the blog. I don’t think I’ve ever met a pumpkin soup that I didn’t like! 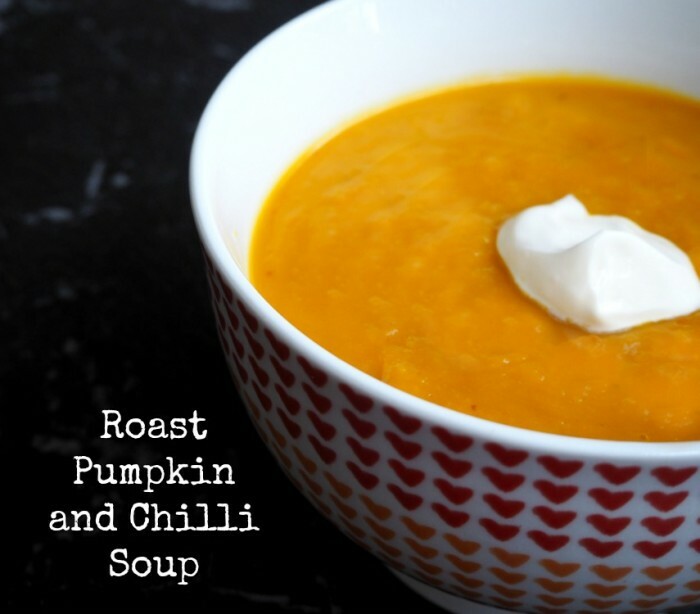 Even better if you skip the sour cream, it will still taste souper but you’ll have a bowl of goodness that is also vegan and dairy free! This recipe makes a very thick soup so if you prefer your soup on the thinner side, just add a little more water to achieve a thinner consistency. However you make this, your belly will love you for it, I promise! Preheat oven to 200C / 180C fan-forced. Combine pumpkin, onion, garlic and chilli flakes in large baking dish and drizzle with oil. Bake for 40-50 minutes, turning once, until golden. Squeeze the roasted garlic out of it’s skin and put all the roasted veggies in a large pan. Add stock, bring to the boil on high heat. Remove from heat and allow to cool slightly. Using a stick blender, blend until smooth. Stir through 1/3 cup of sour cream. Season. Ladle into serving bowls and serve with another dollop of sour cream, if desired. Squeeze garlic out of the skin. Add all roasted veggies to TM bowl and add water and veggie stock. Cook for 5 minutes at 80C on speed 2. Add 1/3 cup sour cream (if using,) blitzing for about 30 seconds moving slowly from speed 1 to speed 8. Season. Ladle into serving bowls and serve with another dollop of sour cream, if desired.